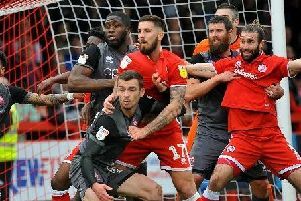 Crawley Town manager Mark Yates was happy with a draw despite his skipper’s last-gasp miss which nearly won them the game. A 93rd minute shot put wide from the six-yard box by skipper Sonny Bradley could have clinched the three points in dramatic style. Yates said: “Literally from the last touch of the ball from five yards out you are expecting the net to bulge and it could have been a slightly fortuitous three points. “It was tough first half against the wind and we had to dig-in. We had a couple of strikes but nothing which really tested Paul Jones. “I wanted more in the second half, I thought there a bit more in the tank but we just didn’t quite have enough spark about us today and couldn’t put them under enough pressure. “They had a good chance: Jones made a good save, which tipped off the bar. “Then we began to impose ourselves on the game. We made three substitutions really quickly which I thought made an impact and sparked us up a bit. Yates criticised substitute striker Shamir Fenelon for not scoring from two chances which came his way. He said: “Just a little bit more belief in himself and an oomph about him, he could have made better of a couple of decent opportunitities which came his way. “We kept plugging away and I’m pleased with our boys’ efforts. “(Hartlepool) are proving difficult to beat and their centre halves dealt with most things we threw at them.